The surface of our snowpack is dominated by a thick wet slab that has retained moisture from the massive rain on snow event of last Friday-Saturday. This wet slab resides on an excellent bed surface (knife hard rain crust) but requires moderate force to initiate failure. Above freezing temperatures will allow this wet slab to persist till Saturday or Sunday when below freezing temperatures finally arrive. Until this wet slab cools down and refreezes, back country travelers need to stay cautious and factor it into their decision making processes. We have been tracking this deep slab in our snowpits for well over a month now. It takes hard force to initiate failure but has always resulted in FULL propagation across the column. This alarms us! Deep slabs are dificult forecast, can be very destructive, and are often triggered from areas of a shallow weak snowpack. Best travel advice is to avoid thin snowpack areas, weak areas near rocks or out crops, and convex slopes. We are still most concerned about the residual snowpack effects of the massive rain on snow event of last Friday - Saturday. Hopefully, we will transition out of this wet and soft snowpack condition when below freezing tempertaures arrive Saturday or Sunday. Remember that it takes time for freezing temperatures to penetrate the snowpack. We can get a solid surface quickly as temperatures drop, but it may take another day or two of cold weather to reach the bottom of this wet soft layer. Until then, continue to use the good solid decision making that has allowed you to return home safely each day. Today I visited Smith Mountain 6,523 feet in the West Cabinet Range. There I encountered a 76 inch deep snowpack on a steep southeast aspect. 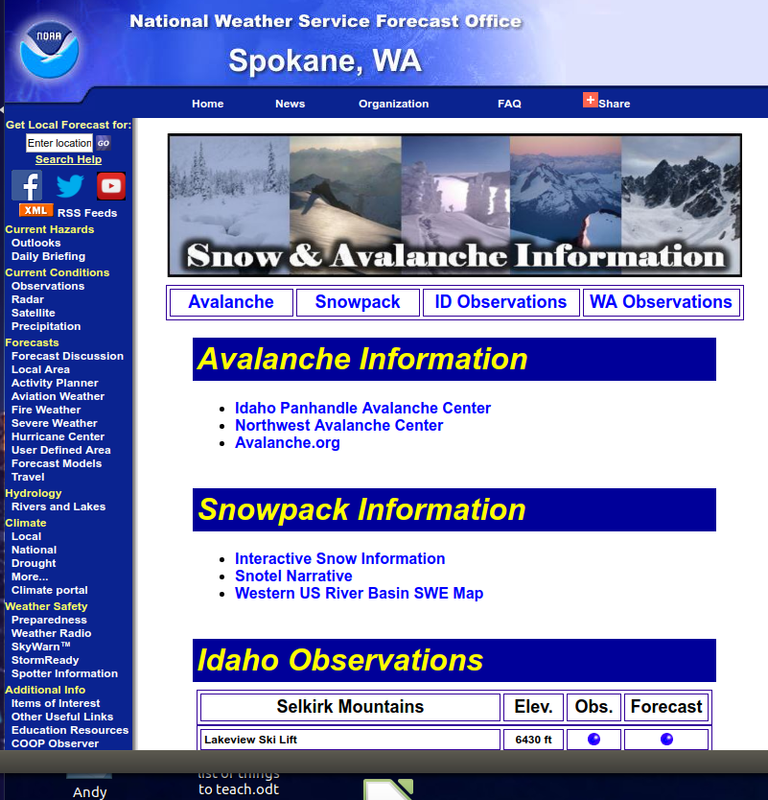 The snowpack is nearly isothermal. Ski and snowmobile penetration is 4-6 inches while boot penetration is 10-12 inches. With some night time cooling, a 1 inch breakable crust has formed at the surface. Below this is 13 inches of wet/soft layers residing on a knife hard rain crust. The remainder of the snowpack below this crust is dry and hard (1 finger to pencil hard). The benchmark Thanksgiving rain crust is found at the 18 to 22 inch level. Extended Column Tests yielded partial propagation with moderate force (ECTN 18) above the knife hard rain crust at the 62 inch level. Above this is a 14 inch wet slab. A second fracture that produced partial propagation with hard force (ECTN 21) was at the 54 inch level. Above this is a 8 inch dry 1 finger hard slab. Since the Tuesday, February 10th advisory, weather in the Kootenai Region has been warm and dry. All SNOTEL sites are reporting tempertaures above 35º F except Hawkins Lake at 6,450 feet reporting above 32º F. All sites continue to report SWE drainage from the snowpack ranging from -0.1 inch to -0.3 inch. 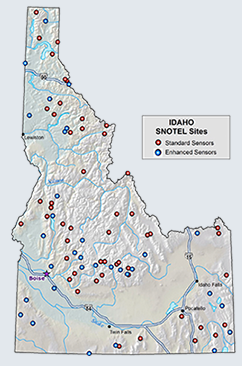 All sites continue to report snowpack settlement of 1 inch to 4 inches. Weather yesterday at Smith Mountain 6,523 feet (Smith Patrol Summit) in the West Cabinet Range (W. Cabinet Range south of Smith Mtn) was mostly cloudy, no new snow, ridgetop winds southwest at 5-12 mph, and 35ºF. Forecasted weather through Saturday is mostly cloudy (60-80% cloud cover), temperatures above freezing day and night, southwest winds 4-9 mph, no chance of precipitation till Saturday (60%), accumulations of 1 inch above 5,500 feet, and light rain below 5,500 feet.